Buying the latest “shiny new toy” available in the B2B marketplace is a common occurrence, oftentimes leaving businesses with a new tool in their tech stack that they never get to leverage to its fullest extent. This is because a lot of planning must be done when transforming your business, positioning teams to learn and adopt tools more effectively. During a sit-down with David Lewis, CEO at DemandGen International, he shared a sneak peek into his upcoming keynote session at the B2B Marketing Exchange, where he plans to share the best paths to innovation and change within an organization. He also shared the importance of “removing friction” from the buying process and how companies can begin to take that approach with customer experiences. Demand Gen Report: The event theme this year is “seeing B2B through a new lens” — what advice would you give marketers looking to evolve their strategies and successfully change things up this year? David Lewis: The past few years of marketing technology innovation has led marketing down a path of exploration around trying new tools and systems with the goal of leveling-up their marketing game. However, most of those investments were made without a solid plan for adoption and usage. Going forward, don’t even start down a buying path for new tech unless it aligns to goals and priorities. If you’re investing in salestech, you need to be absolutely sure you have full support from sales leadership and a sales team that has the technical competency and desire to embrace new methods of hunting, selling, closing and engaging, or you’ll waste time and end up frustrated and pointing fingers. You should be investing in tools and resources for content marketing like content hubs, video hubs, inbound marketing, and improving your existing adoption of marketing automation by doing a refresh of your lead scoring and nurture programs. Optimizing these essential lead management programs will always give you a solid ROI. Also, keep going with your ABM agenda. There is no overnight success there, so stay on the journey. DGR: What trends are you seeing in the marketplace, specifically when it comes down to the digital transformation that has continually impacted the industry? Lewis: Today’s buyer welcomes and is benefiting from a largely digital marketing experience. Yet, the sales experience is still very analog with phone calls, in-person meetings, negotiations and contracting processes. Most of the overall experience your buyer (and customer) has with your company by 2022 will be mainly without human interaction, so it’s critical that business leaders identify ways to reduce friction in the buying process or they will lose to companies that provide a better customer experience. DGR: In your session, you plan to teach attendees how to be “agents of change” in the digital era. What exactly does that mean and why are marketing departments in the perfect position to lead this change? Lewis: My favorite cliché is “the only constant is change.” I love change and embrace it. As an entrepreneur, I thrive in changing environments. Agents of change are leaders that see past the horizon. They see beyond what is and bring focus on what can be. They are leaders that capitalize on technology, communication, energy and transportation innovation to enhance their products, services and go to market strategy. Look at finance, legal, HR and operations departments. Not to be too stereotypical, but these departments not only struggle with change, but they actually enforce standard processes and require conformity for consistency. Marketing, on the other hand, has always been a function that fuels creativity, change and experimentation. This comfort with trying new things puts marketing in a unique position to be the agents of change. DGR: What else can attendees expect to learn from your presentation at B2BMX 2019? Can you share a sneak peek? Lewis: I prefer keynotes have a bit of mystery and anticipation so I’ll simply say this… attendees will be inspired to bring about change in the organization that will dramatically enhance the customer experience. 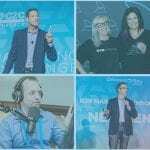 Lewis: I am a big fan and always get inspired by David Meerman Scott, who I had on my DemandGen Radio podcast recently, so I’ll be sitting front row for that one.